Dwight was ready to go. His locker was clean, and he had all the origami he made in his backpack. Then, when no one was looking, Dwight ran into the bathroom, went into a stall, closed the door, and locked it. Then, he reached into his pocket. He pulled out a familiar friend. He put the friend on his finger. Dwight smiled. “Here we go..” He smiled even bigger as he said the last word of his sentence, the one word the would change everything that happened. “Oh.” Dwight picked up the skittle, and popped it into his mouth. “I wish Origami Yoda could go help Micah,” he said. Origami Yoda disappeared, and Dwight pulled out another wise and old alien-based finger puppet from his pocket. Dwight smiled. Whatever came their way, and no matter what school they went to, McQuarrie’s former students would be the New Hopes of different schools. Whole new territories would be explored. This wasn’t the end. Not by a long shot. And only one word which escaped Dwight’s mouth could prepare the students for their biggest adventures yet. JC, you used my idea for making this an epilogue! Yub Nub! By the way, the writer of that comment was me… forgot to write my screen name/nickname. Doctor Glue I presume? Interesting. Why start with the 11th? Where’s the reply button? And, TOTALLY, but why not the ninth? I love Nine, but alas, I don’t believe he will be in this story. 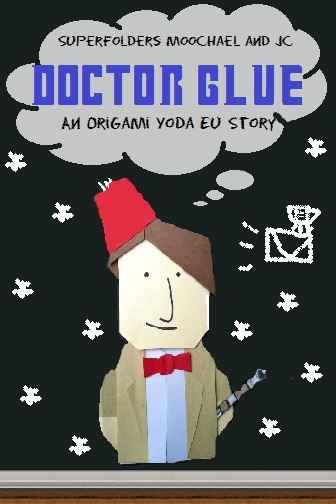 Idea: have a prequel series for every origami doctor, in each doctor’s respective time period… like we could have a 1st doctor story set in the 1960s, with Dwight’s father or grandfather or something…. The 11th Doctor is cool like fezzes and bow ties. Was this hinting at doctor glue? Sorry, I didn’t read the comments. Could you put the Doctor Glue cover on this page, please? I CALL DOCTOR GLUE! I’M CALLING IT NOW! I WRITE IT! PLEASE!!!!!!! Love the Art2-D2 body you have there. I have something to say. The starting sentences? The one that began this epilogue..? Is the story out already? Not the video. The actual story. Wasn’t there an original one? Will The Doctor (And Dwight) go into dwights (new!) backpack thats 100% made by him and that looks like the Tardis and travel to the diffrent schools to help people with there problems? I am also a Doctor Who fan! I’m watching Doctor Who right now,in fact! If I were you, I would make it the 12th Doctor… or wait until the new doctor comes. Will these new features be release to Office365? Managing aliases is a huge problem in the Enterprise when one user has multipple Office365 aliases and identities in different email domains on the same Office365 account.